A woman dressed in Yakutia's traditional indigenous robes, pictured in a typical local landscape. Images edited by Tetyana Lokot. WhatsApp, the Facebook-owned messenger app that recently grew its global user base to over a billion users, is very popular in Russia's far eastern Yakutia region—but how private are the Yakut users’ conversations, really? 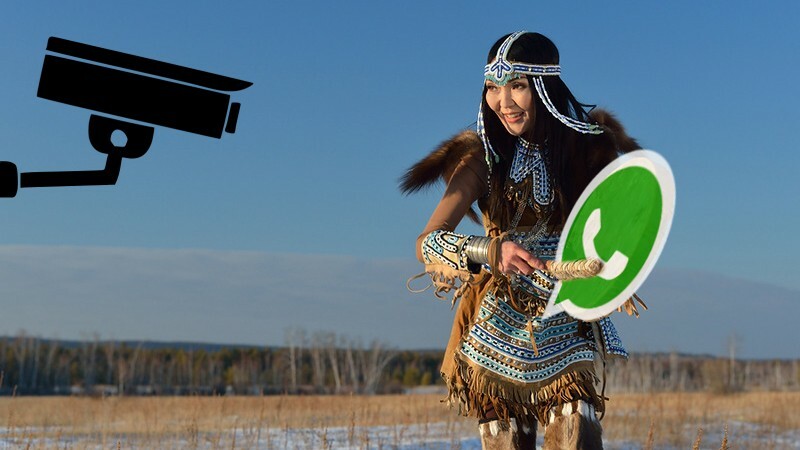 Local journalists in the Siberian region (also known as the Sakha Republic) have already dubbed the craze “WhatsAppmania.” Yakuts use the app for just about anything, with the average WhatsApp user in the region subscribed to more than 13 group chats. Banks, restaurants, and shopping malls use the chat feature to announce their latest deals. Non-profit organizations engage their communities through message exchanges. Local lawmakers are even opening WhatsApp-based reception offices to talk to their constituencies. The regional emergency services use the app to spread news about fires or accidents, and to solicit information and help during search and rescue operations. The local media often turn to WhatsApp as a source of news. One local news website commenter summed up the popularity of WhatsApp nicely: “[In Yakutia], if a person doesn't have WhatsApp, they don't have a phone.” Even small villages tend to have their own WhatsApp groups where they share daily happenings. Because the app is so popular, and yet allows for more personal conversations and privacy than social networks like VKontakte or Odnoklassniki, there is the inevitable issue of policing communication and speech. But, as it turns out, the law enforcement in Yakutia isn't worried about WhatsApp—and its encryption—at all. At a recent public discussion on the interethnic issues in Yakut media, Sergey Ponomaryov, head of the regional anti-extremism center (part of the Interior Ministry, also known as Center “E”), said that those who seek to incite violence or extremism online can forget about any sort of anonymity on WhatsApp. Although the Center “E” head didn't explain exactly how they were able to find the anonymous users or uncover their personal information, he hinted that the anti-extremism police had significantly broader powers when engaging in investigative work, allowing its agents to be more intrusive and less respecting of things like user privacy. Since WhatsApp claims to provide end-to-end encryption for their users’ messages, the local Center “E” must have at least some technological capacity or local ISP cooperation in order to break through the encryption—or find alternative ways to access content stored on users’ phones, such as hacking individual WhatsApp accounts (akin to cases reported in Pakistan). Another option could involve a network of informants among WhatsApp users, but it's unclear from Ponomaryov's comments whether this is a likely explanation. The Siberian region's anti-extremist activity seems to be focused almost entirely on the Internet and digital communications: according to their statistics, all extremist materials discovered during the past two years were found online. There were six such cases in 2014, three in 2015, and several new cases are currently under investigation. Ponomaryov reported that none of the users prosecuted under extremism charges have gone to prison, and have received administrative sanctions instead. Yakutia isn't the only part of Russia where WhatsApp is hugely popular. In Chechnya the messenger serves simultaneously as a market square, a kitchen table, and a bench near an apartment building—a space where people are comfortable discussing gossip, critiquing the authorities, and sharing the latest sports news and fun videos. However, several recent cases of Chechen Internet users being exposed and publicly shamed for their online criticism of the region's leader Ramzan Kadyrov have also raised fears that the messenger's privacy may be compromised and resulted in a mass migration of Chechen users from WhatsApp to Telegram, which is thought to be more secure. One of the more resonant cases was that of Ayshat Inayeva, a Chechen social worker, who shared an audio recording of herself on WhatsApp criticizing local social security and utility policies, and saying that Kadyrov didn't care about “the ordinary people.” The two-minute audio was shared through a WhatsApp group chat and then reposted widely among Chechen users. Three days later, Kadyrov himself publicly shamed Inayeva and her husband on state TV, bringing them into the studio and berating the woman for airing her grievances on WhatsApp.